LED NEON-FLEX, LEDNEON-FLEX, the idea to replace GLASS NEON! NEON-LED, the new idea for NEON!!! ---SMD NEON-LED, EXTRUSIVE SMD LED FLEX-STRIP ---New! 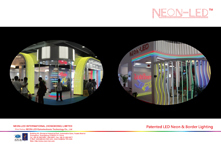 http://www.neon-led.com. Copyright © 2005-2014 NEON-LED, All rights reserved.